Although we remain in the bounce now/roll later camp with silver, we updated the ratio comparison of silver and gold we occasionally highlight to the Dot-Com Bubble in 2000. Our last updated of this series was done on October 2nd of last year as the precious metals were cresting following the commencement of QE3. 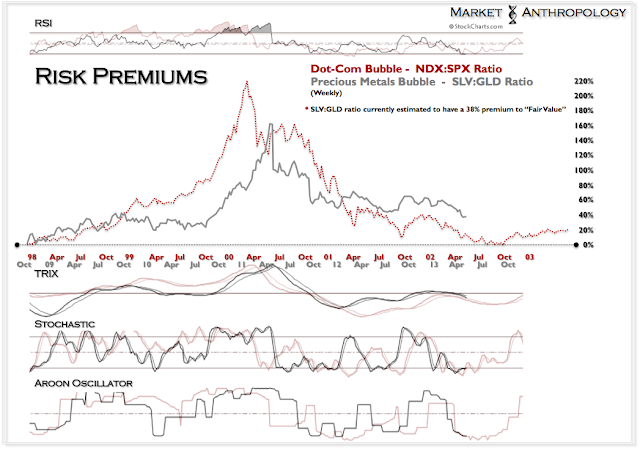 This comparative contrasts the NDX:SPX ratio through the breakdown in March 2000 with the current silver:gold ratio. 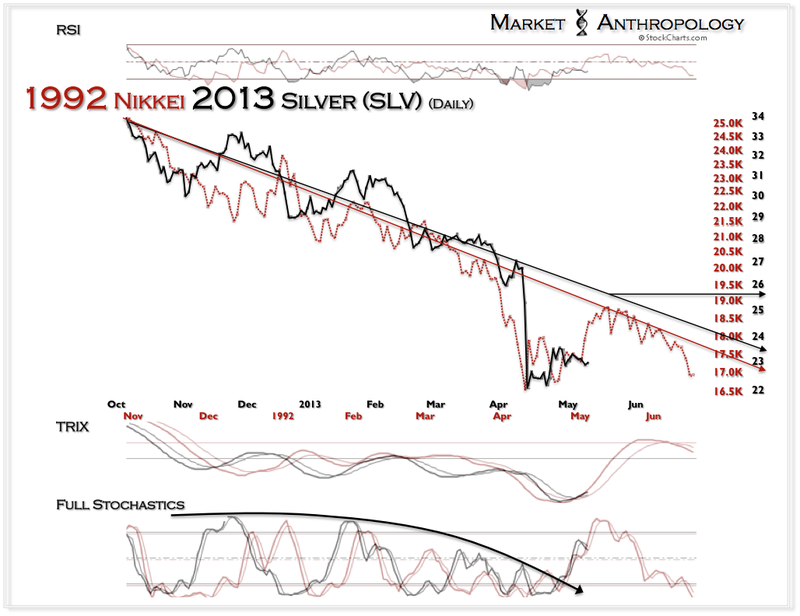 Despite typically providing leading barometric conditions towards the equity, commodity and currency markets, for this perspective the performance trend of the silver:gold ratio serves as a boom-and-bust signature of the asset class itself. Like the Dot-Com bubble that was pricked in 2000, the higher beta numerator (Nasdaq/silver) exhausted in parabolic fashion several months before the more conservative denominator of the asset bubble carved out a broad top (SPX/gold). For comparative purposes, the study was normalized based on their respective momentum lows preceding (NDX:SPX 1/98 & SLV:GLD 10/09) each parabolic run. This inception point for the NDX:SPX ratio also became the retracement low of the bear market that followed the Dot-Com bust.